For all football fans this is sad news. At this stage not so much is known other than that the winding up petition has been brought by HMRC for an unknown amount clearly relating to a tax bill. What is known is the debts of the club exceed the last stated value of the company as 5.5 million £. 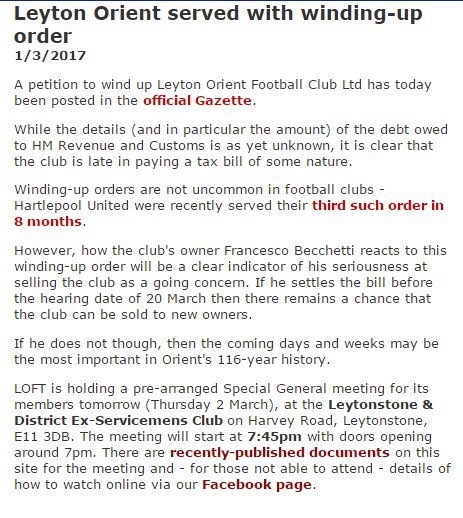 Winding up petitions are not unknown in football but the Orient fans , who deserve the support of the whole football community, await the response of their owner. Will he pay the tax bill and then sell the club? LOFT the fans group are holding a speciallly convened meeting tomorrow . The real question is what exactly has gone wrong since Francesco Becchetti bought the club in July 2014. From Barry Hearn. The club had been doing well under his auspices. They narrowly missed promotion being beaten by Rotherham in a play off final. That year Orient were a great team with good attitude and gave Brentford a run for their money. The Trotta goal lives in all Brentford fans memories. Since then they have had nine managers. This speaks volumes for an ownership style . I always have been a Brentford fan and have always respected Orient. A decent club with decent fans. Struggling in the geographical shadow of West Ham. I truly hope this situation is resolved and the club is sold to someone with passion for football with some knowledge and insights. Becchetti has already rejected at least one offer. Let us hope there is someone out there who will buy Orient. The potential is there for a stable league 1 side. Liquidation is a terrible option but relegation to the National League is also not a great one . The better option is a quick sale allowing some prospect of avoiding relegation. Just goes to show how quickly fortunes can change. Very sad indeed.